This newest addition to the popular and award-winning, "The Littlest…" series by Sylvia Rouss proves that worth and character are not to be judged by outward appearances. The littlest tree in the forest triumphs as the villagers search for wood to build their new synagogue. While the sheer size and mocking attitudes of the massive trees surrounding our hero are daunting, he has faith and hope. Using TinyTap's Sound Board, reading and question and answer pages, your child will be fully entertained engaged in this adorable educational game. - Allows independent play. 'The Littest Tree' is created using TinyTap. ● TinyTap - Create Educational Games You’re invited to create games like this one with TinyTap Game creation platform. TinyTap lets you turn everyday moments into personalized educational kids games. With TinyTap learning is a personalized and fun experience which can be tailored to suit a child’s unique educational needs. Creating a game is simple. It’s also the best way to turn precious moments into memories that can be relived every time you play the game. All you need are some pictures and narration. In a matter of seconds you have an educational game that’s not only fun but will develop your child’s creativity in unimaginable way. 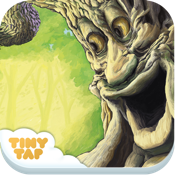 The Littlest Tree - Kids free educational game about trees is an iPhone and iPad book about a tiny tree in a big forest. The tale goes on about his adventures and experiences, and is read aloud to your child.